Recombinant monoclonal antibody to CD20. Manufactured using AbAb’s Recombinant Platform with variable regions (i.e. specificity) from the therapeutic antibody 10F381 (rituximab). Immunogen: Human lymphoblastoid cell line SB. Specificity: CD20 (Human B-lymphocyte-restricted differentiation antigen, Bp35), is a hydrophobic transmembrane protein with a molecular weight of approximately 35 kDa located on pre-B and mature B lymphocytes, and most B-cell non-Hodgkin's lymphomas, but is not found on stem cells, pro-B cells, normal plasma cells or other normal tissues . Note on publication: Describes the making of the chimeric murine anti-CD20 antibody 2B8 in conjunction with human kappa and IgG1 heavy-chain constant region sequences, and analysed using flow cytometry, in vivo pharmacology and animal systemic/tissue toxicity tests. 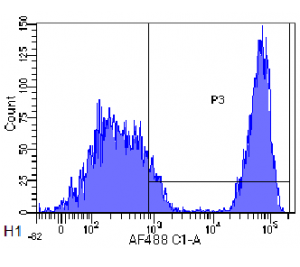 Flow-cytometry on rhesus monkey lymphocytes using Ab00126. 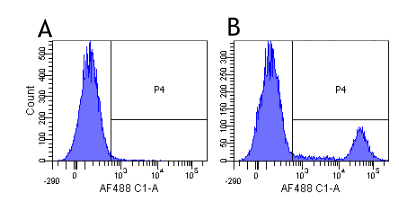 Flow-cytometry using the anti-CD20 research biosimilar antibody Rituximab (Ab00126) Rhesus monkey lymphocytes were stained with an isotype control (Ab00102-23.0, panel A) or the rabbit-chimeric version of Rituximab (Ab00126-23.0, panel B) at a concentration of 1 µg/ml for 30 mins at RT. After washing, bound antibody was detected using a AF488 conjugated donkey anti-rabbit antibody (ab150073) and cells analysed on a FACSCanto flow-cytometer. 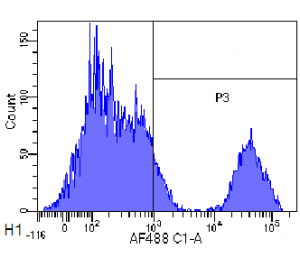 Flow-cytometry on cynomolgus monkey lymphocytes using Ab00126. 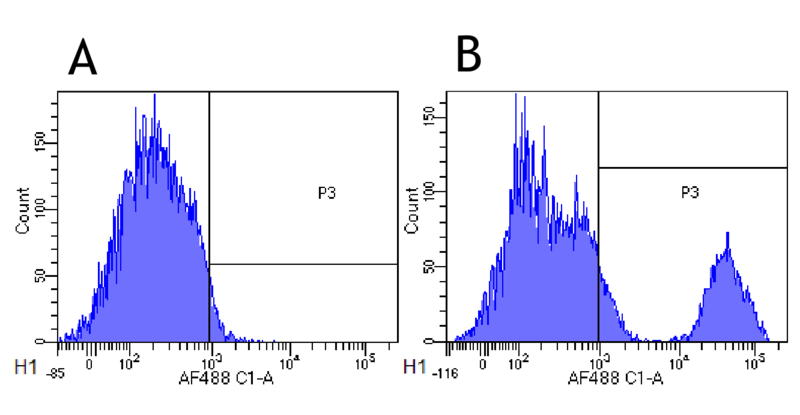 Flow-cytometry using the anti-CD20 research biosimilar antibody Rituximab (Ab00126) Cynomolgus monkey lymphocytes were stained with an isotype control (Ab00102-23.0, panel A) or the rabbit-chimeric version of Rituximab (Ab00126-23.0, panel B) at a concentration of 1 µg/ml for 30 mins at RT. After washing, bound antibody was detected using a AF488 conjugated donkey anti-rabbit antibody (ab150073) and cells analysed on a FACSCanto flow-cytometer. 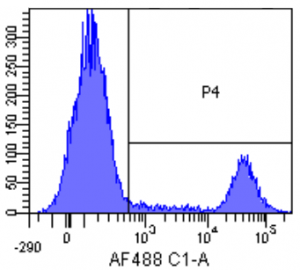 Flow-cytometry on human lymphocytes using Ab00126. 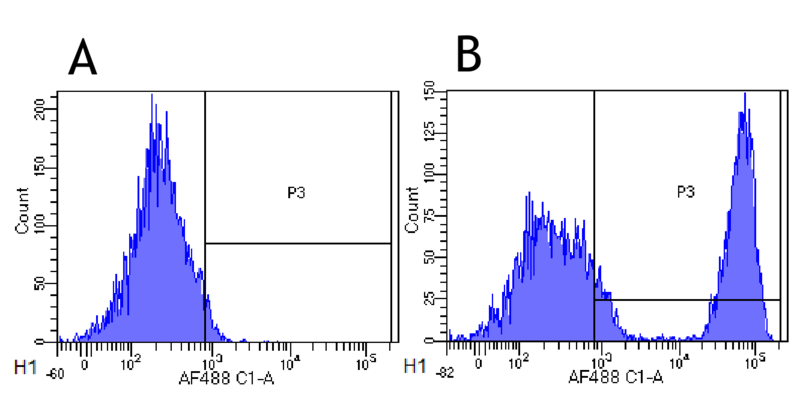 Flow-cytometry using the anti-CD20 research biosimilar antibody Rituximab (Ab00126) Human lymphocytes were stained with an isotype control (Ab00102-23.0, panel A) or the rabbit-chimeric version of Rituximab (Ab00126-23.0, panel B) at a concentration of 1 µg/ml for 30 mins at RT. After washing, bound antibody was detected using a AF488 conjugated donkey anti-rabbit antibody (ab150073) and cells analysed on a FACSCanto flow-cytometer.